12 per order. 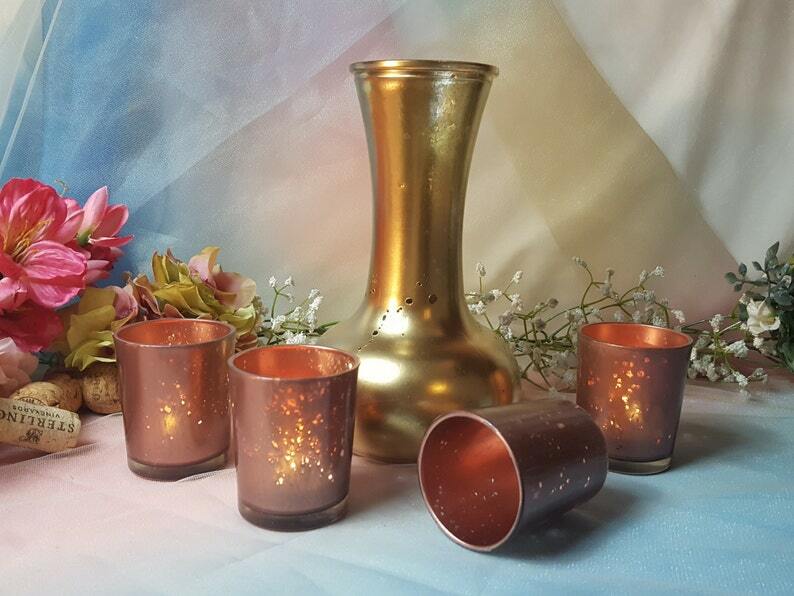 Custom designed Rose Gold Mercury ~ Aluminum Mercury ~ Gold Mercury ~ votive candle holders. They are beautiful & stunning. They are all painted inside. ROSE GOLD MERCURY IS NEW!!!! Love this! Hint of Pink / Rose and Gold all in one. Just like Rose Gold Jewelry. These are a Mercury / Droplet effect that is painted. If in doubt about the color - email me. I want to make sure you are happy with your color. These are different because they are painted inside. I have tested them with fuel cells and there is no issue at all with burning. You have the glass effect outside and the Mercury inside. The shipping price is good for up to 5 orders(sets). If you need more - I need the amount you are interested in and the state where they will be shipped to for a true price. It will really help with your event date and what color you would like. All of our Votives Holders are hand painted. Each votive is a one-of-a-kind. There will be slight variations in color. Perfect for your Wedding Reception Decor and as a favor for your guests. Great gift for a Hostess, Teacher, Bridesmaids, Holiday gift, or even to decorate your table at home. They are beautiful no matter where. Size - 2" W x 2.75 H / aprox. Email me (ask a question) and let me know so that I can create a custom order with Gift wrapping. ► All of our votives candle holders are custom created. Most orders filled within a few days, larger order take approximately 1 week to create. Then they are shipped to you. Votives add romance and warmth to any table setting. So, don’t overlook the candle holders when decorating for your party. Consider your dessert table, gift table, dinner tables, appetizer table and your bar area. Forget those plain glass votive holders… these votive candle holders are beautiful and wallet friendly. The best part is your guests can take them home as a Party Favor! Then store them for your next party and have fun creating the table-scape. Also use them on your fire place mantel. Almost anywhere in your home. I bought these Votive candle holders in rose gold for my wedding. They are absolutely lovely and look stunning on their own. They did not need any other decoration to off set it. They appear as they do in the photos and were shipped quickly and safely. Thank you for your beautiful and original work!